When you hear the name Godzilla, what do you usually think of? 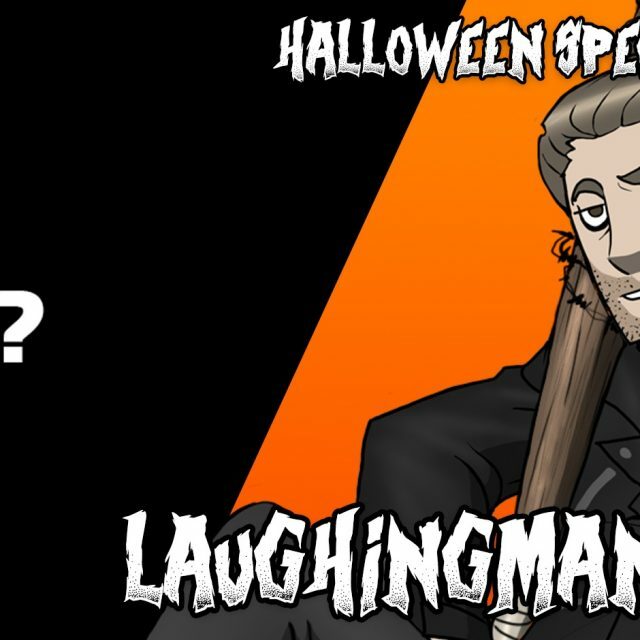 Men in rubber suits, monsters beating the crap out of each other, and badly-dubbed humans delivering forced, awkward dialogue. With exactly twenty eight Godzilla films to date, it’s not very hard to imagine that the King of Monsters is best known for being a sort of anti-hero, taking on evil creatures from outer space, human experiments gone wrong, or even… monsters made from toxic waste… Godzilla has evolved as a character for over three series of films, and he has become such a famous hero in popular culture that he has appeared in commercials, has his own video games, and even has a star on the Hollywood Walk of Fame. Some of my fondest childhood memories involved renting Godzilla films from the local Blockbuster, such as “Godzilla vs. Gigan”, and I loved the series so much that my parents even got me a whole VHS boxset of the scaly badass. However, like many people who also grew up with him, I knew Godzilla as a monster who defended mankind. 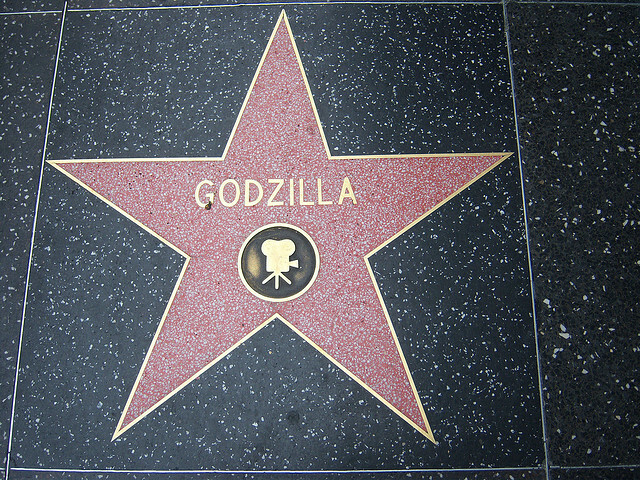 What I wasn’t aware of in my youth, however, was that before he became defender of the Earth and friend of the people, Godzilla was a symbol of destruction, death, and agony. 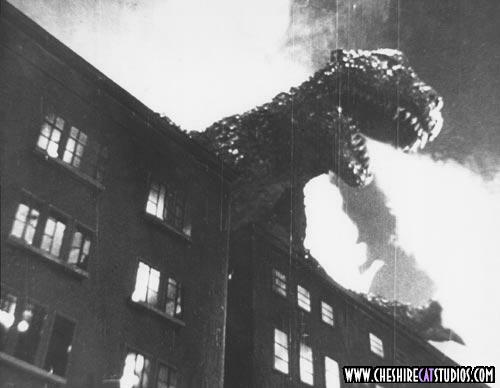 Toho, a Japanese studio that was known for producing educational films throughout the 30’s and 40’s, began their 60-year tenure of creating kaiju (giant monster) films in 1954 with Gojira, directed by Ishiro Honda. 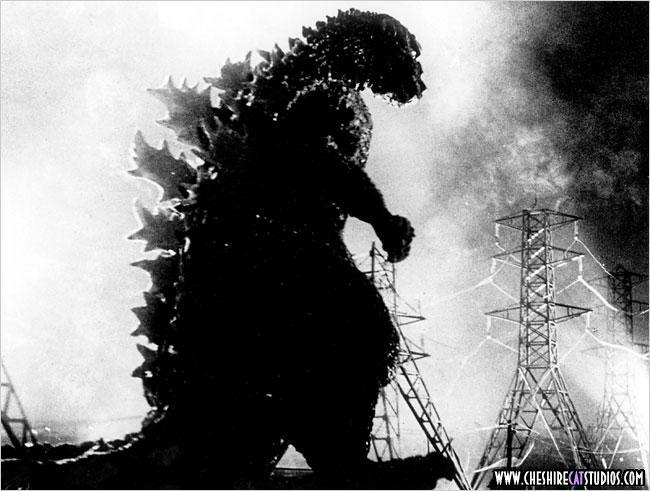 While it is easily regarded as one of the greatest foreign films of all time, perhaps the most startling thing about Gojira is that it is strikingly different from the other movies in terms of tone and atmosphere. Whereas the other Godzilla movies are campy as hell, such as “Godzilla vs. Mechagodzilla” or “Godzilla: Final Wars,” which are straight-up action films without rhyme or reason, the original story was a post-war allegory warning about the dangers of nuclear bombs; the title monster Godzilla acts as a symbol of the destruction and devastation caused by the atomic weapons dropped on Hiroshima and Nagasaki. As a kid, I would have never understood that, but having watched this film as an adult I can say that I can definitely appreciate its message, and actually be impacted by the dark brutality in which the devastation of Godzilla’s wrath is depicted. 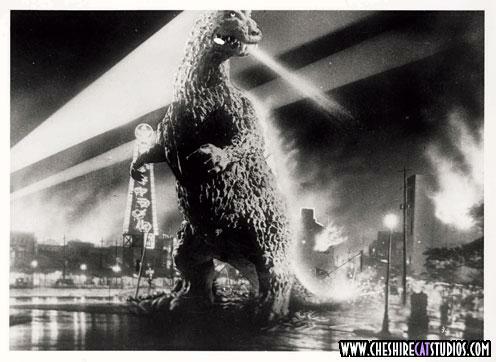 Upon first watching Gojira, the tone of the movie feels like a 50’s monster flick. When I say that, Them! or Earth vs. The Flying Saucers come to mind where the focus is on its human characters, who, after encountering a mysterious creature or entity that either destroyed something or made a military convoy disappear, talk and try to figure out what it is that is terrorizing the population and causing mischief. It is very science fiction in its approach, where the humans find things like giant footprints and study them to try and figure out where the monster came from, and there is even a scientist with a cliche eye patch. There is also emphasis on another b-movie convention, where the military tries to subdue the monster before they fail miserably, and that is where the cliche comes from in later Godzilla films. Around the time Gojira was made, this stuff was commonplace in 50’s b-movies, and I certainly know that if I watched this when I was a kid, I would go “Come on, where’s Godzilla? I don’t care what you are talking about, I want to see the damn monster!” However, while the movie is about the King of Monsters destroying Tokyo, this isn’t the main focus, and the human characters actually matter (more on this later). 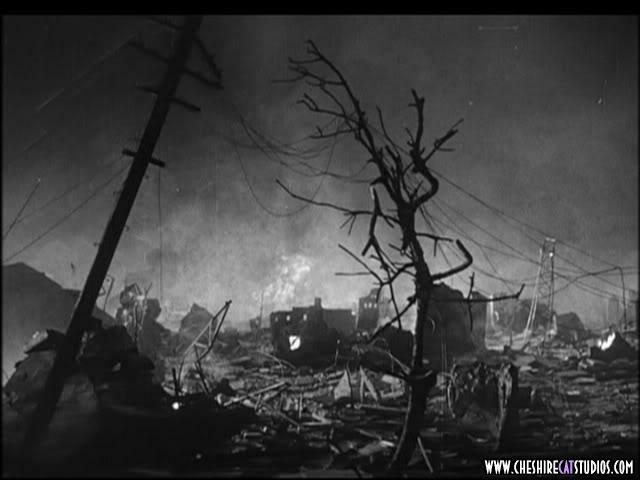 Whereas the first half of Gojira feels like a 50’s b-movie ala Them!, the second half goes into War of the Worlds territory, where all hope seems to be lost, and humanity seems doomed. It’s an abrupt change in tone, but it is also what makes this movie a classic in its own right. This cliche will continue on for 28 movies. Throughout the movie, there is a lot of buildup towards the appearance of Godzilla before he finally wreaks havoc on Tokyo in the second act. Honda’s direction really helps establish Godzilla as a credible threat to Japan with the pacing in the first act, opting to not even show the monster until about 25 minutes in. Instead, to act as foreshadowing, you witness an unseen force of nature destroy people’s homes while they sleep, and completely engulf battleships without any effort. It’s in these scenes that we get a sense of the danger yet to come, and Honda further amplifies the tension with not only the scenes where scientists are studying the cause of these attacks, but also with scenes like impatient families hearing that battleships with their sons or fathers have been sunken. It’s important to build tension like this because when it is done right, the climax is all the more effective, and you can sympathize with the plight of the people. When Godzilla finally starts rampaging through Tokyo in the second act, about 40+ minutes into the movie, the tone of hopelessness and futility comes in full force, people fleeing for their lives as the mammoth creature obliterates the city while every effort to stop the beast are easily thwarted. It is in this part ofGojira where I felt my heart sink when I saw the destruction from the people’s point of view, lovers crying over the crushed bodies of their spouses or people fleeing from their homes as they come crashing down. A specifically poignant moment comes when the camera focuses on a cowering mother with her children, where she says to them “We’ll be joining Daddy soon…” Tokyo is a sea of flames, and there is nothing anyone can do. It’s incredibly chilling, and I’m still haunted from these scenes. Unlike other Godzilla films, where the destruction is more for sheer spectacle, the damage is really felt here as you see the plight of the Japanese. The aftermath of the destruction is no less hopeless, where the audience sees a hospital scene where the sick and dying lay. The destruction depicted is intentionally hard-hitting to illustrate the horrors and hell of the destruction caused by the dropping of the atomic bombs on Japan, and the pain seen in the Japanese people and their prayers for peace near the end of the film are especially effective as a result. The aftermath of the attack. To make the destruction feel authentic, Honda not only told the story well but the technical work put into the film also helped immensely. The camera work utilized makes Godzilla feel like a giant, and it feels more authentic as a result. Usually, low camera angles and manipulation can make anything seem giant in a movie, and a lot of those were employed in order to make Godzilla come to life. A lot of this has to do with the focus on the pain of the human characters, as a lot of the destruction is seen from their perspective, and seeing Godzilla from ‘ground level’ helps achieve the illusion that he is giant. The models of buildings and vehicles also look convincing, so the shots of Godzilla destroying the city does not look cheap. It also helps that the editing assists in achieving the illusion that Godzilla is real; during his initial attack on Tokyo, for example, Godzilla attacks a train. The editors intercut the shots of Godzilla attacking the train model with people in the train being shaken around and injured, so the illusion is made all the stronger with this manipulation of perspective. There were other effects that emphasized the impact Godzilla’s attacks had on the city, such as when the editors spliced shots of people running away with shots of Godzilla attacking the model of Tokyo, so this forced perspective makes the movie more realistic. The care put into the special effects and technique helps Gojira have a larger impact on its audience, and I think it goes without saying that if the movie looked cheap, then it would not have nearly as much impact as it does. In conclusion, while many fans of the Godzilla series may see them as mindless action flicks that can be enjoyed by kids and adults alike, I wanted to shed light on the movie that started them all, because although it is ultimately still about a giant lizard menacing Tokyo, Gojira is drastically different from all the rest in a more meaningful way. 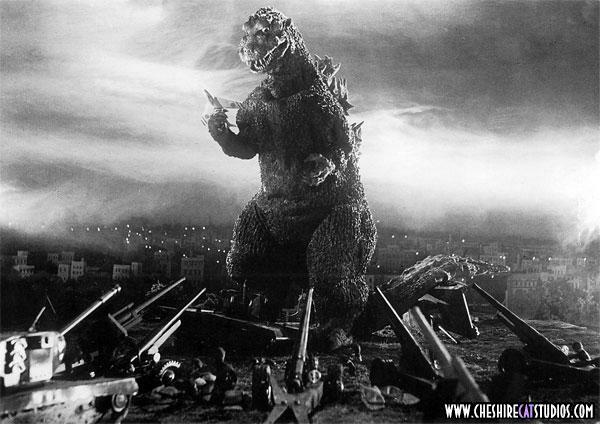 Whereas the destruction of cities is merely a spectacle, and the people are a very minor part, in the other Godzilla movies, the original puts these two factors as the main focus, making Gojira a cautionary tale about the evils of nuclear weapons. Although it carries a lot of the 50’s b-movie cliches that other films in this period had, Gojira is known as one of the greatest foreign films of all time because of the emotional depth that it carries, its second act brutally forcing the audience to witness the hopelessness and desperation of the Japanese populace. 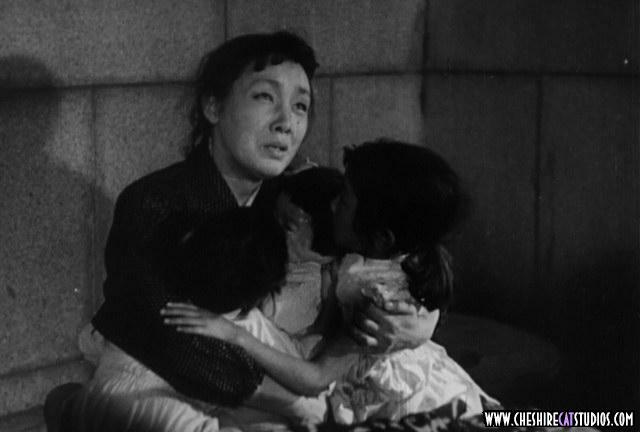 While you never see anybody get hurt in the other films, the original Godzilla movie shows the kind of suffering that would realistically happen; I am still haunted by a few moments in particular, like the mother and her children preparing for their untimely deaths. 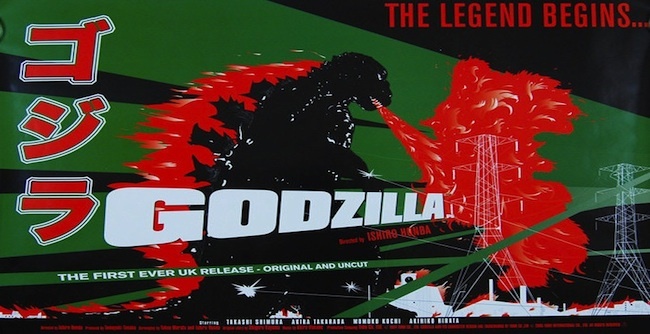 Although Gojira ultimately has a happy ending, the devastation caused by Godzilla’s attacks is what makes this movie powerful, especially with Ishiro Honda’s direction, the pacing of the story, the care put into the technical aspects of the film, and the ultimate message that it has to offer. Although my generation, and the generations that came afterwards, know Godzilla as a badass monster who puts other beasties in their place, just remember how the King of the Monsters originally got his start, and give this movie a watch on either DVD or Netflix. Born in the stomach of a whale in a small fishing town in Antarctica, Kenny knew that his life mission would be to end world hunger, save Tibet, and finally learn how to dougie. Instead, he ended up studying law and writing the "Food For Thought" article series for CheshireCatStudios.com. One day, he hopes to become President of Brazil and blow up the moon.